For years I have thought of karma as God’s sense of humor. It now seems to me that my kids are also in on the joke. Check out these pants. Do I respect the efficiency of fusing your pants and underoos into one removable set like a human banana peel? Oh yes. Do I also respect the fact that collections of said sets are left hidden amongst the balled up dirty socks? Oh no. I agree that it can be annoying to try to figure out what to do with that one ever-present sock that continues to reappear but never seems to have a match. Again, high-five on your creativity. However I feel like there could be better options for this sock that don’t involve the silverware drawer. Maybe you could put it in the clothing drawer dedicated to lonely singles of the sock world? Yes – I have that drawer and yes the other sock was in it. I get it. I said “use a chip clip on the bag after you finish eating” when I should have said “don’t do that utterly ridiculous thing you know not to do because we have discussed it repeatedly and you keep ruining our food.” My bad. This is a shout out to the spouses of the world. I discovered this stale cracker crime scene one day too late. Thanks so much babe for helping scientists confirm that the inability to correctly utilize a chip clip is in fact dominant in the human genome. Ok so you did blow your nose per my request. But there’s this very small part of me that feels that perhaps – and to be clear, I’m no expert here – just maybe you could have opted for a couple less squares of TP?? Your unhelp with regard to feeding the dog has not gone unnoticed. With that said, I would like to mention that we typically put the food in the actual dog bowl as well as the actual dog mouth. We also give her actual dog food. Beyond that, I think you did it just right. As we all have moments of noteworthy unhelpfulness, I wanted to wrap this up with one last pic that involved the whole family – yours truly included. I would love to tell you that this was staged, but this work of art was totally legit. We had fallen into (and tripped over) this ridiculous collection many times. Every shoe size living in this house was represented in varying degrees in this mountain of footwear. How could my OCD have failed me so deeply and allowed it to occur? If you look in the background, you will notice the real bonus of this pic. There are TWO shoe racks in the background and both have space. Since the time of this photo (taken a few months ago), I have added more shoe racks combined with an exponential increase in meltdowns on my part. Amazingly the problem has been mostly resolved. Please hear me on this because it only works if you apply both parts of the technique. You cannot just rely on shoe racks. A constant reinforcement of the mommy meltdown plus the addition of too many shoe racks to justify any further excuses is the best way to achieve any level of shoe organization. To expedite the process, I suggest integrating disappearing Xbox remotes and the refusal to make cookies. This works on a personal level as well because you create an inner sense of guilt that is akin to “Oh crapola. I want to leave my shoes here but I have to pick the damn things up since I just hollered at everyone for leaving theirs in the same spot. Plus I want cookies.” This is the only scenario I seem to have addressed with any level of effectiveness. The others continue to be shining examples of the countless ways unhelp is incorporated into our daily lives. If you are needing tips on how you can learn to unhelp more around your own home, I strongly recommend that you ask your kids for actual help. It sounds counter-intuitive, but I can assure you that this is the fastest way to witness optimal unhelping techniques. Spouses and partners are also great teachers in this department, but don’t be afraid to look in the mirror either. You, too, have the power to sabotage food storage, house cleanliness, and the general basics of staying organized. If you can recognize the mere seconds it would take to do the job right, and then do absolutely nothing with them instead, you will be well on your way. Best of luck. Few things have the potential to spice up your kid’s 10th birthday celebration quite like the unwelcome realization that you apparently purchased balloons that should have been placed in the bachelorette party section of the local grocery store. I was concerned when I removed the first deflated version from the package, but perhaps it was just my imagination?? My husband blew up a balloon and showed me the result with the animation of one passing the salt. Unable to comprehend why he wasn’t seeing what I was seeing, I just stared at him blankly and finally shook my head no. Then my son ran in beaming with pride that he had also blown one up! Despite personally having the equipment, neither of these guys was paying attention to the obvious style of the decor. I wasn’t about to have those things waving back and forth in front of our house, so I explained that the latex was too thin and the dogs might eat it if they popped and also maybe I had read about a recall notice in the past couple of hours since purchase due to radiation contamination. I could see confusion in their eyes, but I grabbed the balloons and redirected them to other tasks. There would be no suburbia Latexgate. Goodbye bachelorette balloons. Despite the absence of the salacious address markers, the doorbell began to light into action minutes later. My husband was occupied with setting up kid-appropriate party stuff on the back patio, so I hurried to the door to greet and introduce myself to multiple sets of parents. As all small children are sent to this planet with an innate sense of optimal embarrassing timing, my two-year old naturally understood that it was the ideal moment to decide that pants were no longer her thing. She shuffled after me pushing her little jeans below her knees like a mermaid on a mission. “So nice to meet you as well! We should get the kids together for summer! Yes my other kid usually wears pants!” Enjoy it now small one because someday I will be in charge of selecting your graduation and rehearsal dinner video pics. You’ll wish you had opted for pants then! Drop-off time came and went, the tidbit child ultimately agreed to don some shorts, and the older girls cranked up the decibel level and headed to the patio. 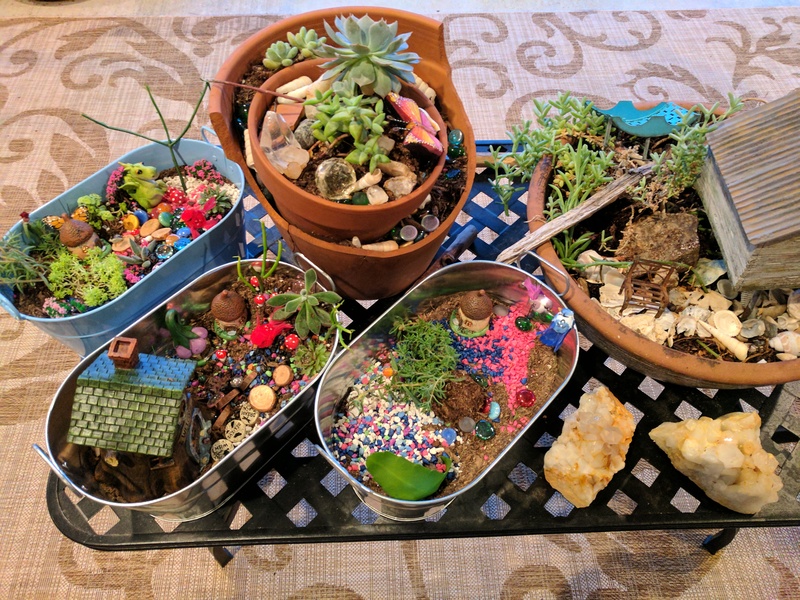 I had come up with the very clever idea to have them make their own fairy gardens. It is so easy and will save you tons of money to DIY this event at home. I recommend that you plan a two-hour + party to do this. The idea that DIY parties are cheaper is mega crapola, you get to clean your home in a big way before and after your party, and there is a strong chance that parents will leave your home with the impression that you raise pantless toddlers. Two hours is the perfect length of time as long as everyone leaves early – say around one and a half hours. Beyond that, you need an alternate activity. Lucky for all, I had thrown the idea together over a couple of days, was totally unprepared for anything beyond gardening, and did not have an alternate activity planned. And then right on cue, a Texas thunderstorm appeared. Within a few brief minutes, the skies went from somewhat cloudy to extremely menacing with growling thunder. My husband and I rushed to relocate the girls and their mini-gardens. He herded the girls to safety as I moved some of the gardening items to the new super cool shabby chic party spot we unaffectionately referred to as the garage. As surprised as I was to see them there at that time, that didn’t hold a candle to the shock I felt when I heard these words – “There’s a tornado over there.” The son turned and pointed past the street, and I could see the funnel cloud in the sky behind him. I have lived my entire life in an area prone to unpredictable weather, but until that point, I had never seen a funnel cloud in person, and I definitely hadn’t seen one in person with a dozen other people’s’ children playing in my home. We raced inside and corralled everyone into the large closet under the stairs. (When you hear that everything is bigger in Texas, they are actually referring to the closets.) We hung out for a few minutes, joked around with the girls to keep it light, and ultimately headed back out for cake and whatever else for the remaining minutes. To be totally honest, I’m not really sure what we did from that point on. I was so rattled by the whole thing. I had mistakenly believed that Wizard of Oz theme parties were reserved for huge Judy Garland, Liza Minnelli, and Cher fans, but clearly this was not the case. In hindsight, I should be thankful because it did effectively fill that open alternate activity spot. The truth is that it really scared me. I am still trying to figure out how to show my gratitude to my dear friend for coming over to warn us to take cover. I recognize that her daughter was with us, so mama instincts will always kick in, but she and her sweet son still put themselves at risk to protect all of us. We had been oblivious to the tornado. As it turned out, our local warning system did notify us of the impending threat – twenty minutes after it passed – but that is how it can be with tornadoes. The latest technology makes educated assumptions, and then life happens however it happens. Above all, I think the key point to remember is this – anyone can go roller skating (except ironically for me because my ankles vote no), but how many people can schedule a three location party (patio, garage and closet all in the same time slot – WHAT?!?!!?) AND bring in a real live tornado to kick it up a notch??? So stick that in your bouncy house! And you thought DIY stuff was lame. Not here baby. This pic was taken by a neighbor who had the time to get the shot given her lack of other people’s small humans in her home. Naturally, I burst into laughter. It was my instant reaction, and of course anything that makes her that happy makes me extra happy (excluding cutting her own hair or shirt, indoor basketball / indoor moon sand, and that time they got the sock stuck on a window ledge fifteen feet high). I wasn’t trying to make fun of her or step on her feelings, but her smile disappeared and twisted into a hurt grimace in an instant. My heart broke when I saw her face fall. Far be it from me to recognize that the best way to improve an initial misunderstanding is to go with a different approach, so I dug myself further into the emotional rabbit hole. I went for levity yet again – my go to defense mechanism when it comes to diffusing an uncomfortable situation. 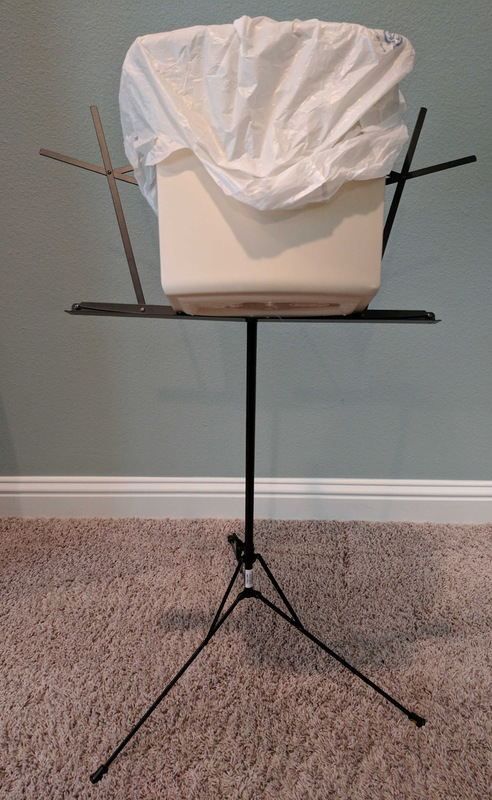 I explained that I wasn’t teasing her by laughing, but I hadn’t been aware of her love of the trash can musical arts. To the surprise of no one in the universe, she became angrier and it devolved from there. I switched to overt and clear validation of the “Well that’s so exciting!” and “I’m so proud of you!” genre, but she had already tuned me out and the moment – the joyful happy “I can’t wait share this with my mom” moment – was gone. Kids are like rubber balls that bounce right back. She was onto a different topic and back to normal before our car had even made it back home. I, on the other hand, continue to wrestle with it days later. I keep trying to get that excitement back. I want it for her. I want it for me. How long will this keep circling around in my mind? Her birthday is a couple weeks away, and I will probably end up buying her a metal trash can and drumsticks. I have visions of purchasing all of Amazon’s Oscar the Grouch paraphanalia because no one appreciates the magic of trash cans more than that surly muppet. Maybe I’ll switch from an SUV to a larger truck designed to move and empty dumpsters. Given the amount of garbage my three kids have left in my car over the years, this may be a logical vehicle change anyway. Raising kids is like aiming for moving target. Sometimes you are spot on, and sometimes you just miss the mark. All I can do is try again, and hopefully I will get it right the next time. That’s it from me for now. Ironically, today is garbage day, and I have trash cans of my own to tackle. Remember pinwheels? These cheerful little treats have been sold since the days when marketing departments felt that giving childhood goodies names like ding-dong and ho-ho was a good plan. To be fair, they didn’t have urban dictionary, and I’m doubtful that those specific terms had truly spread their wings at that point. Each morning, I drop the big kids off at their respective schools and then head with my smallest to her daycare. We don’t put her in daycare because my husband and I both work to pay the bills and our companies prohibit toddler companions. It’s strictly due to our shared love of strep throat, ear infections, and the judgement of other parents who choose alternate lifestyles. Our few minutes en route to said daycare consist of driving directly toward the rising sun, fighting with sunglasses that won’t stay on the face of a two-year old, and proving once more that there are zero placement combinations for my car’s sun visors that will cover the two-inch square of sunlight perpetually aimed at my child’s face. Redirection is my technique of choice, so I make sure to have little snacks in the car to keep her occupied. Thus enters the pinwheel onto the scene. As with every cloudless morning, my toddler was angry about the sun’s ongoing assault on her retinas. I reached back and passed a pinwheel into her small hand. She was instantly appeased and my eardrums were given a momentary reprieve. That moment was not to last because she went from sedate to hysterical one minute later. She was so upset that I was concerned that maybe I had unintentionally handed her a roll engulfed in flames. Thankfully I remembered that I had left that one at home. But why was she so upset? What in the world was going on? She was so distraught that I had to pull the car over to stop whatever was terrorizing her. I parked, jumped out of my seat and rushed to open her door. There was no blood. No broken glass. No barbed wire. Just a two-year old with tears streaming down her cheeks pushing a pinwheel into my face. Someone had taken a bite out of my daughter’s pinwheel. But who could have done this? The other kids were already at school by the time I had handed her the freshly unwrapped treat. No rogue animals were roaming the vehicle. And given that my little daughter had a chewed on pinwheel in her hand, crumbs around her mouth, and sugar and cinnamon on her clothes, I knew that it couldn’t have been her. Many people don’t believe in mother’s intuition, but I can assure you that it is a very real thing. Mine snapped on in an instant. I understood exactly what had happened. 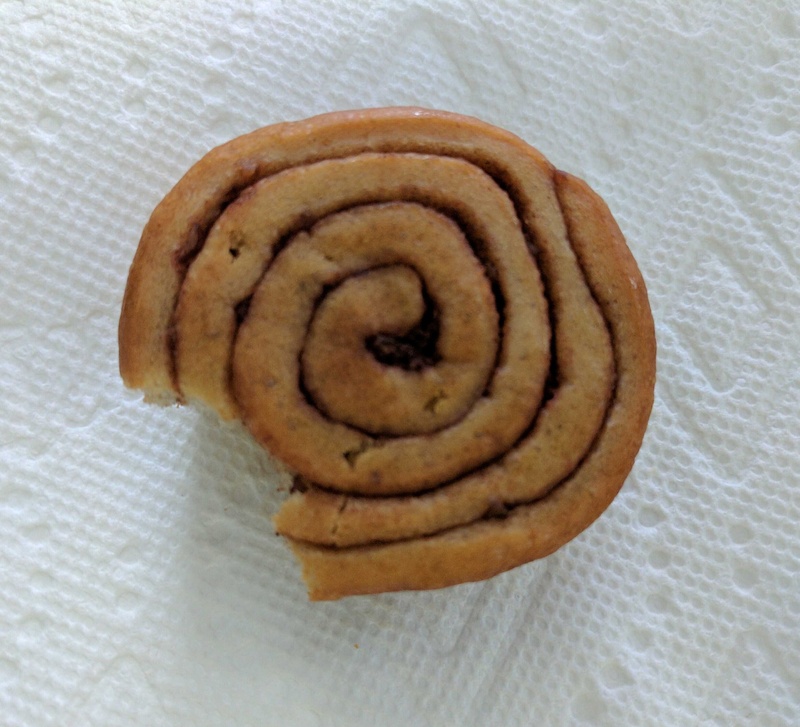 That twisted pinwheel had taken a bite out of itself. For whatever reason, this particular pinwheel felt the need to pull a cruel prank on my child. It had also tried to trick me into thinking that my toddler had taken the bite herself and then forgotten about it, but I would not fall into its trap. I was no fool. So I did what any rational mother with a limited supply of pinwheels would do. I took the maimed roll from my distraught child, turned to face the other way, mashed the thing back into a shape moderately close to a circle, and placed it back into her little fingers. She was elated to be given a “new” pinwheel and the world began to spin once more. With the exception of the rare bowl of ice cream my husband and I attempt to tiptoe past our kids (with zero luck), I truly enjoy sharing all that I have with my children. But being the craziest person living under this roof has always been my thing. I am confident in my cutting edge techniques on making comments and choices that don’t just border on being nonsense – they are straight up bonkers. But here she is infringing on my position as top lunatic, and she’s only two. This kid has raw talent you just can’t teach, and her skills are increasing at an exponential rate. Although I called it first, I think perhaps my reign is at its end. I am being out-crazied by my toddler. Mother’s Day can be a mother of a day. This “holiday” has been a major source of stress for me for years. I genuinely want the extraordinary moms in my life to understand how precious they are to me. Although I dream about doing something amazing and special and wow-worthy, the odds are uncomfortably high (and not ever in my favor) that I was unable to scrape together enough time or energy to shower every day over the previous week, let alone put together all the required parts of a grandiose plan that would adequately display my sincere love and appreciation. To give you a sense of how fantastically together I am on the personal planning front, I can share that I am currently quite excited because my Christmas cards that should have gone out five months ago may at last be in the mail sometime in the next few days. Or weeks. Or sometime in June. Probably July. Ideally at the latest by Christmas of this year. And then there’s my own Mother’s Day. If that’s going to be an actual thing, I will probably need to plan that, too. The mamas also residing in the Land of Reality know what I’m talking about. Should I make a reservation in advance somewhere fancy or should I save time and just call Denny’s or IHOP to confirm that they haven’t instituted a dress code since last Mother’s Day? Do I buy my own gift and have my husband tell the kids to give it to me to reinforce the importance of honoring significant people in your life, or should I just glue my own popsicle sticks into the shape of a frame and declare the holiday complete? This isn’t intended as an indictment of my family or some narcissistic need to be put on a pedestal for a day. I donated all pedestals to Goodwill years ago because nobody ever used them, and we needed the space for our dust-covered treadmill. At least we can stack laundry baskets on that. I’m blessed with beautiful loving children whom I adore (even more so after caffeine) and a husband who is pretty fantastic when it comes to most things related to house, kids and family life. He’s not perfect, but we wouldn’t make it if he was. He’s a kind man, a wonderful man really. In addition, he genuinely tries to modify his approach when he recognizes that something he does or doesn’t do upsets me. There is a strong possibility that a significant portion of his willingness to change may be directly correlated with the tone and/or volume of my request, but nevertheless it is clear that he sincerely wants me to be happy and feel appreciated and loved. So I decided to get in front of the issue in advance and have a talk with my husband before the Mothers Day weekend actually started. I explained to my husband (I snapped) and shared my feelings (I totally flipped out) about my concerns surrounding how we had handled that “holiday” in past years. I needed him to understand that it made me truly happy to plan and buy and do year after year for our moms but that happiness came to a screeching halt when with the planning and buying and doing was on my own behalf. Hurt feelings with the added bonus of getting to do extra work in the guise of “celebrating” my day never made for a happy wife happy life (or at least not on that weekend). The funny part is that the moment he started talking about options and ideas based on the places he had called, I no longer cared if we went anywhere at all. It was like a switch had been flipped, and my hurt feelings disappeared in an instant. I realized that the only thing I had truly wanted was to feel worthy of a little effort that showed me that they appreciated me. That he appreciated me. But my Mother’s Day also included big fat hugs and sweet wishes from my husband and children. Each one told me how much they loved me as they wished me a happy Mother’s Day. Well all except the littlest who became quite angry and insisted on wishing me happy birthday instead. She is nothing if not committed to absolute accuracy even when she is absolutely inaccurate. In between rounds of temper tantrums, we were able to spend time with one of my precious moms and some of my amazing sisters and their (our) families whom I adore. Before and after the various rounds of cleaning, I’ve had lovely conversations with other important mamas and will be seeing some of them in the next few days whenever we can make it happen in a no stress kind of way. Ultimately I got the breakfast I really wanted – breakfast tacos made by someone else and wrapped in paper. It was a dish-free dream! My husband and kids tackled the remaining dishes that appear at random like ceramic gremlins. We all did laundry and then we went out to dinner. A few minutes ago I sang “Baby Mine” to my youngest child – my darling angel (who will turn on you in a moment’s notice if you mess with her and quite often even if you don’t). It was a low-key beautiful day that was unexpectedly exactly what I wanted – laundry and all. I should have told my family how I felt a long time ago. I wanted them to just get it, to know how to prove to me that they saw me, to understand that a small plan requiring a little initiative by them and no effort by me would make me feel very valued as a mom and a wife. But I never said it like that. Actually I never said it at all. Not even to myself. This past year was a challenge for many of us, and on this Mother’s Day, I am reminded that I am thankful for the moms who have helped me to survive and to flourish. I have amazing mothers in my family (moms, grandmothers, sisters, friends) and countless others who continue to catch me when I fall and help me when I fail. They are my partners in laughter and tears and worst of all – tee ball. I celebrate all of you. I am in awe of you, and I thank you for the endless ways that you inspire me to be a better spouse, parent, daughter, sister and friend. I’ve never been short on words, but I have felt like I have been unable to find my voice for quite some time. Maybe this is the start of my finding it again. I wanted my family to see me, but I finally recognize that I needed to see me first. We often feel so small, but we are doing spectacular things. We are literally creating the future. Each of us shapes the life experiences of every person we contact. You matter and you are valued. There is no day on any calendar that will ever be able to convey how precious and treasured you are. Hold onto the hugs. Eat dessert first. Vote for pancakes for dinner. And if you can, find your voice. And this is the magic and why it’s all so worth it!